John Deere is one of the largest manufacturers of tractors and other agricultural machinery. Many of the John Deere's owner's manuals can still be purchased as reprints. There is one manual that you absolutely must have; that is, all tractor collectors should own the manual that matches their tractor. 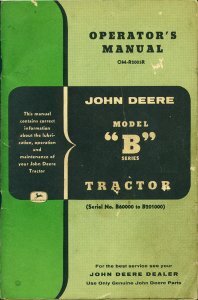 For example, this is the owner's manual for the John Deere Model B. This particular copy is an early reprint, but new reprints of it, (with a different cover) are still available from John Deere and other sources. How to get those @#%&$! wheels off! 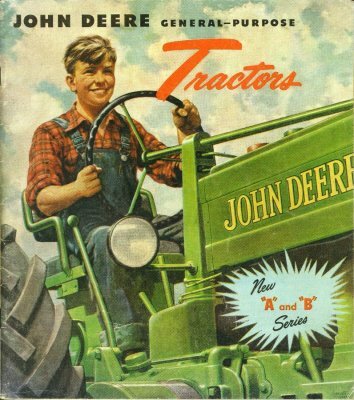 This brochure came out in 1947 to announce the major revisions in the John Deere Model A and Model B rowcrop tractors. The sounds of a two-cylinder tractor! Return to "Something about Gene"